I love food and relaxing over a good meal but I do worry about food related things too: how much cooking fuel costs, how sustainable the food I eat is, how I can eat well on a budget. If that makes me sound neurotic, I’d rather say that I prefer to think about the best way to do things, rather than putting my head in the sand and carrying on in the way I always have. And the messages about thinking about what and how we eat are really stacking up. Obesity in the west is still a growing problem, while people are starving all over the world. I read that in the UK weight and diet related illnesses such as diabetes are the biggest drain on the health service. In the UK we throw away around 30% of all food produced – I haven’t seen the current figures, but I am pretty sure we haven’t turned things around significantly in the last couple of years. And this is at a time when most people are finding the cost of living is rising, and income is at best static. Fuel prices are gong up year on year, and likely to continue to do so. The amount of meat eaten in the west per person is unsustainable – as summarised on the BBC Horizon programme last week. Plus eating more than a very small amount of (red) meat each day leads to health issues too – fat around your internal organs for one. Part one of Horizon focused on the amounts of meat we can healthily eat. We’re reducing the size of the meals we eat – and this is easier if you eat food like stir fries and shepherd’s pie. You just have a modest portion to begin with, eat slowly and enjoy, and then think carefully about whether you really need a second helping. This ties in well with our efforts to manage our weight through exercise. 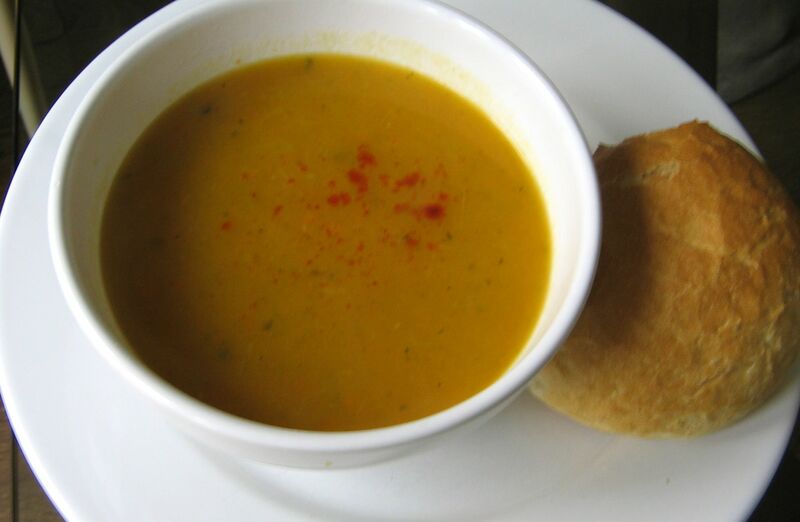 We make truly delicious vegetable soups from the rather scrawny looking items left in the vegetable rack and fridge on a Saturday, sometimes supplemented by anything seasonal and good value from a shop. You can easily make six servings for just a couple of pounds, and we freeze what we don’t eat to have for lunches later. We’re trying out meat free days, rediscovering things like jacket potatoes and salads. We’re finding that if they are well done they are delicious. Vegetarian recipes from around the world are well worth checking out. We’re eating more dishes that combine small amounts of meat with terrific vegetables to make food that doesn’t feel meat free – stir fries with a sprinkling of pork, or chicken, or prawns, for example. Shepherd’s/cottage pies with lots of veg in the mix to make the meat go further. We’re slowly learning how to use lentils and pulses well – so they add to the meal rather than dominating it. We’re careful about when we buy meat – we cook a roast on the days when we have company, or know we will use it all through the following days, or have the time to cook something from the leftovers and put a dish in the freezer. Never throw away meat, and only throw away vegetables if you really have to. We check through the freezer regularly to make sure we eat the things we have put in there, rather than having a yearly (or less frequent) sort out, when spoiled food ends up in the bin. We’ve also bought a pressure cooker, and think this will work well for us. 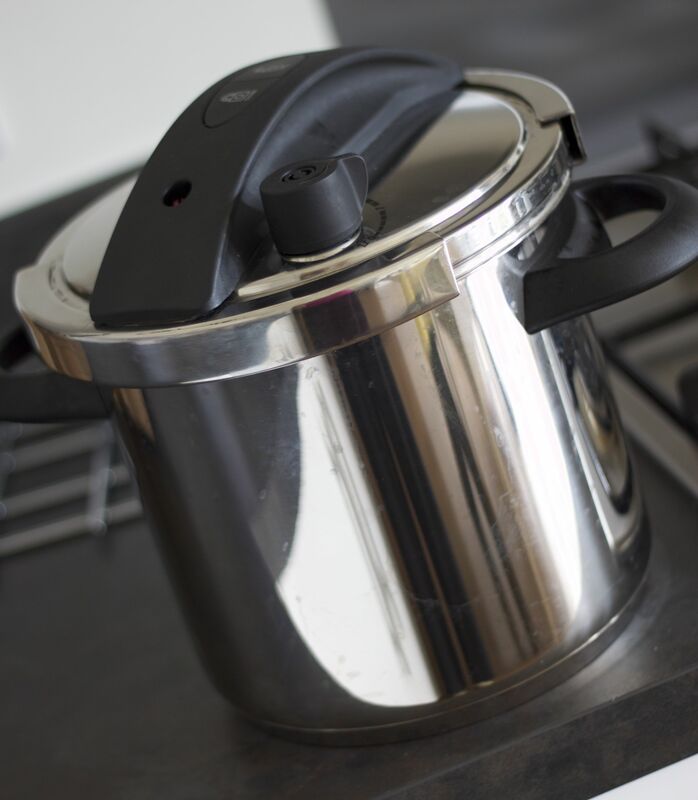 It’s a bit of an investment – the one we bought cost close to £100, but it reduces the cooking time by up to 60%. This means it also reduces the amount we spend on fuel by 60%, and this should come into its own when we get to the colder weather and stews becoming appealing again. I wonder how long it will be before we have saved £100 in gas bills? Stews are easy to cook in the pressure cooker, and they are another great way to use cheaper cuts of meat, and to increase the veg: meat ratio without anyone noticing. We’ve also invested in a couple of recipe books focusing on stews from around the world, so the choice is much more exciting than the word sounds. The plan is to cook up a good quantity and freeze enough for a couple of meals. Then we’ll only need to reheat to enjoy – saving time and minimising energy costs. Stew really is a word that needs reinventing. Suggestions anyone? I remember pressure cookers from the old days – terrifying things hissing away threateningly on the cooker. I always felt that the cook was taking their lives in their hands every time they turned the thing on. Not so with the modern incarnations, which are quiet and feel much safer – although you do of course have to read and follow the manufacturer’s instructions carefully, and there is a little trial and error initially in getting the timings right, as you get to know the equipment. We had considered getting a slow cooker for many of the same reasons, but decided this wouldn’t work for us. We are not quite organised enough to get everything we need ready for a meal long enough in advance of wanting to eat. The pressure cooker means we can be spontaneous and cook something pretty quickly when we are ready to eat. I haven’t unpicked the costs involved in all these decisions, as I haven’t been using the pressure cooker for very long. My feeling is that we are managing to reduce our basic food bills, so it is less of a burden to afford celebration meals for a treat. We shall see how all this works out, but it’s definitely food for thought!